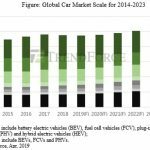 Volume production of PV cells based on PERC (passivated emitter rear cell) technology is expected to reach a new peak in 2017 on account of advances in equipment and manufacturing process. The latest PERC technology report from EnergyTrend, a division of TrendForce, states that PERC cell suppliers that began to expand their production capacity last year will be completing their works in the first half of 2017. Global PV cell production capacity on the whole will increase this year, while PERC cell capacity is forecast to reach 25GW by the year’s end. 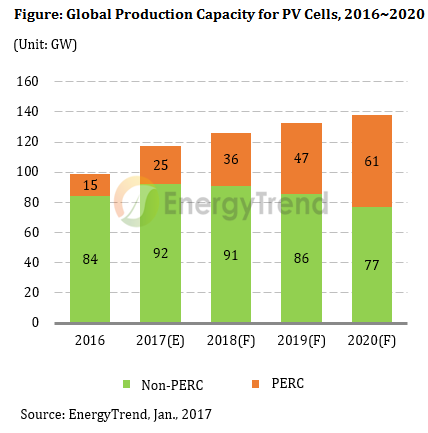 The total annual output of PERC cells is also expected to double compared with 2016. According to EnergyTrend analyst Kenny Ko, the 2017 PV market is likely to follow the pattern of the previous year. “Demand will be strong during this year’s first half and then cool down rapidly in second half, resulting in a very unbalanced market cycle,”said Ko. Cell prices in general will be in a downtrend from a long-term perspective because of oversupply caused by the increase in the total capacity. Under this circumstance, PERC cells, which have an advantage in conversion efficiency, will have higher product margins relative to conventional cells. Ko pointed out that demand for high-efficiency modules and distributed generation systems is still on the rise. Also, China’s “Top Runner” program contains requirements that only advanced, high-efficiency products can meet. With the price difference between mono-Si PERC cells and conventional mono-Si cells kept at US$0.05 per watt or greater on average, cell makers are going to choose to produce the former product due to profit consideration. Another trend that favors PERC cells this year is the increase in the standard wattage output of mainstream modules from 290 watts to 295/300 watts. For cell makers, adopting PERC will be the most cost-efficient and feasible way to meet the higher output specifications. Among PERC cell suppliers, Taiwan-based companies have been able to compensate their disadvantage in production capacity with higher yield rates and products of higher efficiency. Nonetheless, Taiwanese PERC cell suppliers this year will face stiff competition mainly from capacity leader Hanwha Q CELLS and the growing number of Chinese suppliers. “With some adjustments to operational strategies, Taiwanese suppliers will be able to stand their ground in the global market,” said Ko. EnergyTrend’s recent survey of Taiwanese cell makers find that Sino-American Silicon Products is the industry’s leader in PERC technology and has surpasses its competitors in raising the efficiency of mono-Si PERC cells. Currently, Sino-American is capable of mass producing mono-Si PERC cells with efficiency of over 21.3%. 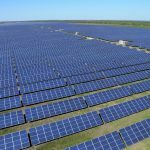 Another Taiwan-based supplier Neo Solar Power (NSP) is focusing on expanding production of high-efficiency PERC modules and collaborating with PV power plants. Two other Taiwanese companies Gintech and Tainergy are deploying their PERC cell capacity in foreign countries from where they can export their products to Europe and the U.S. at higher prices.